Can you confirm these amateur observations of Thamnosophis infrasignatus? Type locality: "Arkafana, Eastern Betsileo." Corrected to Ankafana, Betsileo by Boulenger, 1893a: 247. Types Lectotype, BMNH 1946.1.7.57 (BMNH 1882.2.25.57), a 920 mm female (W.D. Cowan), designated by Cadle, 1996a: 424. Domergue, C.A. 1972. Étude de trois serpents malgaches: Liopholidophis lateralis (D.&B. 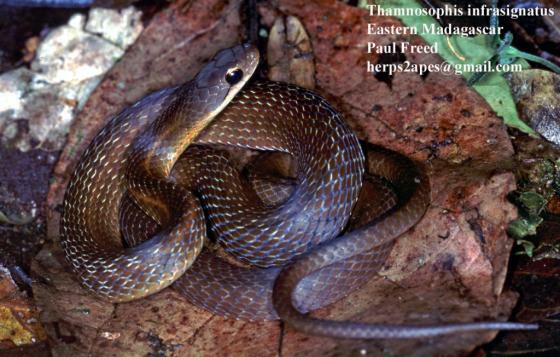 ), Liopholidophis stumpffi (Boettger) et Liopholidophis thieli n. sp. Bull. Mus. natn. Hist. nat., Paris 103 (77): 1397-1412.